I love the song I’m recommending today! Well, I love pretty much everything I’ll be recommending during this year of Handpicked Songs for Preschoolers. So, I may talk about how much I love the song every week. Prepare yourself. Today, prepare yourself for some imaginative play. This preschool song recommendation is actually a compilation of famous classical pieces and an adventure with a friendly chipmunk named Chipper. Though he is completely imaginary (I don’t even have a stuffed animal posing as Chipper), many of my preschoolers consider Chipper a personal friend and they usually request this song by asking if I brought Chipper with me today. A Walk Through the Forest is found on an album dedicated to the art and enjoyment of pretending—Wee Sing and Pretend. 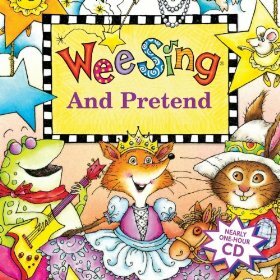 You may be familiar with the Wee Sing series. They are incredibly prolific and have been creating children’s music for years. If you’re looking for a classic children’s song, it’s likely that they’ve recorded it at some point. But, I think this is one of their most playful and interesting albums. When you check out A Walk Through the Forest, peruse through the other tracks and see what else catches your eye. A Walk Through the Forest needs very little introduction. I would recommend that you play along with your child the first few times you listen to this song. You have the chance to demonstrate some of the different ways to dance along and participate in the song, and you’ll probably actually have quite a bit of fun yourself. I always encourage really active participation with this song (dancing and moving around the room), but you may find that your child also just enjoys listening and letting his or her imagination run wild. The other benefit of this song is the exposure to some great classic literature. You’ll probably recognize most of the songs yourself. There is one surprising choice that makes me laugh a little whenever I hear it. But, I’ll let you discover that yourself. Share in the comments if you think you know which piece I’m referring to! You can find A Walk Through the Forest on Amazon or on itunes. I’d love for you to stay in touch with these recommendations. The easiest way is to subscribe to my weekly e-mail. It’s the current weekly post and it just shows up in your inbox. You don’t even have to remember to check the blog. You can also like Tiny Tones Music (my preschool music class) on Facebook and check in periodically there. I’m so glad you’re along for the ride. Let me know if you have any questions or thoughts on these recommendations. I’m also happy to be a resource for your preschool music or piano related questions.